That first smile. Those first steps. Their faces as they flew through the air on a swing for the first time. For most parents, these moments are priceless, moments that are gone as quickly as they happened. Parents have the best of intentions when they begin writing down everything their children do, but that early zeal is soon replaced by the hectic nature of life, and they give up, often feeling guilty that they didn't do more. But it's never too late to go back and recollect these amazing moments; after all, even your foggiest memories are clearer than your child's, who doesn't have the ability to recollect events that happened in his or her first four or five years. Most children are forever asking their parents, "What was I like when I came home from the hospital? What was my first word?" 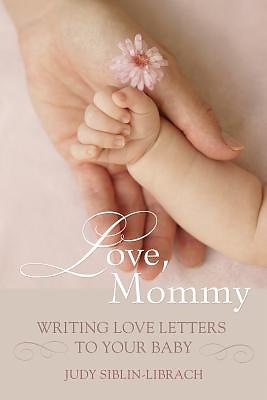 Love, Mommy: Writing Love Letters To Your Baby is a book that finally helps parents recreate their child's memories for them. Author Judy Siblin-Librach, a mother of two, journalist, and talk show host, explains how to recall those moments and give them back to your children as a precious gift of memory. She encourages mothers, fathers, grandparents, and other relatives and friends to join in and try to rebuild those early years for your children. Imagine the look on your child's face when you hand them a series of memories of their childhood, as remembered by you. As a gift for a birthday, graduation, or their wedding, it would be absolutely priceless to them. And maybe you'll see that same look they had as they smiled for the very first time."